454 pages | 159 Color Illus. 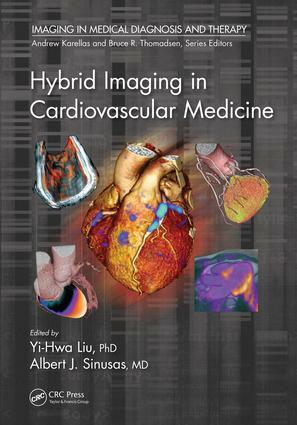 This comprehensive book focuses on multimodality imaging technology, including overviews of the instruments and methods followed by practical case studies that highlight use in the detection and treatment of cardiovascular diseases. Chapters cover PET-CT, SPECT-CT, SPECT-MRI, PET-MRI, PET-optical imaging, SPECT-optical imaging, photoacoustic Imaging, and hybrid intravascular imaging. It also addresses the important issues of multimodality imaging probes and image quantification. Readers from radiology and cardiology as well as medical imaging and biomedical engineering will learn essentials of the field. They will be shown how the field has advanced quantitative analysis of molecularly targeted imaging through improvements in the reliability and reproducibility of imaging data. Moreover, they will be presented with quantification algorithms and case illustrations, including coverage of such topics such as multimodality image fusion and kinetic modeling. Yi-Hwa Liu, PhD is Senior Research Scientist in Cardiovascular Medicine at Yale University School of Medicine and Technical Director of Nuclear Cardiology at Yale New Haven Hospital. He is also an Associate Professor (Adjunct) of Biomedical Imaging and Radiological Sciences at National Yang-Ming University, Taipei, Taiwan, and Professor (Adjunct) of Biomedical Engineering at Chung Yuan Christian University, Taoyuan, Taiwan. He is an elected senior member of Institute of Electrical and Electronic Engineers (IEEE) and a full member of Sigma Xi of The Scientific Research Society of North America. Albert J. Sinusas, M.D., FACC, FAHA is Professor of Medicine (Section of Cardiovascular Medicine) and Radiology and Biomedical Imaging, at Yale University School of Medicine, and Director of the Yale Translational Research Imaging Center (Y-TRIC), and Director of Advanced Cardiovascular Imaging at Yale New Haven Hospital. He is a recipient of the Society of Nuclear Medicine’s Hermann Blumgart Award. "the writing is easy to understand and is made easier by the accompanying high-quality illustrations, images, and tables…. The authors and the editors should be congratulated on this valuable reference in an emerging field that clearly required enormous effort to produce." Yi-Hwa Liu, Ph.D. is Senior Research Scientist in Cardiovascular Medicine at Yale University School of Medicine and Technical Director of Nuclear Cardiology at Yale New Haven Hospital, New Haven, CT. He is Associate Professor (Adjunct) of Biomedical Imaging and Radiological Sciences at National Yang-Ming University, Taipei, Taiwan,and Professor (Adjunct) of Biomedical Engineering at Chung Yuan Christian University, Taoyuan, Taiwan. He is an elected senior member of Institute of Electrical and Electronic Engineers (IEEE) and a full member of Sigma Xi of The Scientific Research Society of North America. He has served for many a years on the Editorial Boards of the World Journal of Cardiology, Journal of Clinical and Experimental Cardiology, American Journal of Nuclear Medicine and Molecular Imaging, Current Molecular Imaging Journal, and American Journal of Nuclear Medicine and Molecular Imaging. He has also served as National Member of American Heart Association (AHA) grants review Committee since 2004, and as Associate Editor of Medical Physics since 2009. Dr. Liu received his BS degree of Biomedical Engineering at Chung Yuan Christian University, Taoyuan, Taiwan, MS degree of Electrical and Computer Engineering at University of Missouri, Columbia, MO, and PhD degree of Electrical and Computer Engineering at Rensselaer Polytechnic Institute, Troy, NY. He completed post-doc trainings in electrophysiology and cardiovascular physiology at Georgetown University School of Medicine and in nuclear cardiology at Yale University School of Medicine. He joined the faculty at Yale University School of Medicine as Assistant Professor (1998 – 2004) and Associate Professor of Medicine (2004 – 2014). His primary research involves non-coherent image restoration, nuclear cardiac image reconstruction and quantification. He is one of the pioneers in the fields of fluorescence microscopic image restoration and nuclear cardiac image reconstruction and quantification. He is the author of over 50 peered review publications, the leading editor of a book entitled "Cardiovascular Imaging" (CRC Press, Taylor & Francis Group, London, UK) and Co-inventor of the Wackers-Liu CQ™ SPECT Quantification Method, FDA-approved Commercial Software Package. Albert J. Sinusas, M.D., FACC, FAHA is Professor of Medicine (Section of Cardiovascular Medicine) and Radiology and Biomedical Imaging, at Yale University School of Medicine, and Director of the Yale Translational Research Imaging Center (Y-TRIC), and Director of Advanced Cardiovascular Imaging at Yale New Haven Hospital. He received a BS degree at Rensselaer Polytechnic Institute, MD degree at University of Vermont, College of Medicine, and completed training in internal medicine at the University of Oklahoma, and training in cardiology and nuclear cardiology at the University of Virginia. He joined the faculty at Yale University School of Medicine in 1990 where he has remained. Dr. Sinusas has served as a standing member of the Clinical and Integrated Cardiovascular Sciences (CICS) and Medical Imaging (MEDI) study sections of the National Institutes of Health. Dr. Sinusas has been a member of the Board of Directors of the Cardiovascular Council (CVC) of the Society of Nuclear Medicine (SNM), and the SNM Molecular Imaging Center of Excellence (MICoE), and the American Society of Nuclear Cardiology. He was the 2008 recipient of the SNM Hermann Blumgart Award. His research is directed at development, validation and application of non-invasive cardiovascular imaging approaches for the assessment of cardiovascular pathophysiology, including the targeted molecular assessment of myocardial ischemic injury, angiogenesis, arteriogenesis, and post–infarction atrial and ventricular remodeling. The investigation of these biological processes involves, ex vivo and in vivo imaging in animal models of cardiovascular disease and humans. This translational research employs the 3–D modalities of X-ray computed tomography (CT) and fluoroscopy, SPECT/CT, PET/CT, echocardiography, and MR imaging in an animal physiology laboratory and clinical environment. Dr. Sinusas has been the principal investigator of several NIH grants involving multi-modality cardiovascular imaging, and directs a NIH funded T32 grant providing training in multi-modality molecular and translational cardiovascular imaging. He is the author of over 200 peer reviewed publications and invited reviews related to cardiovascular imaging, and co-edited a textbook on Cardiovascular Molecular Imaging published in 2007.